I had no sooner got off the train than I heard the unmistakeable voices of three friends from Glamorgan. I was in Cardiff along with a few thousand of my friends and three of them arrived at the railway station at the same time as me. We hadn't planned to meet, I wasn't expecting to see them, but days like this are just like that; filled with fun and friendship! The arena was filled with women of all ages from every part of England and Wales. At least one had come still further, because I found myself (for the second year running) sitting next to Ruth, International Chairman of the Associated Country Women of the World from New South Wales, Australia - how very good to see her again. 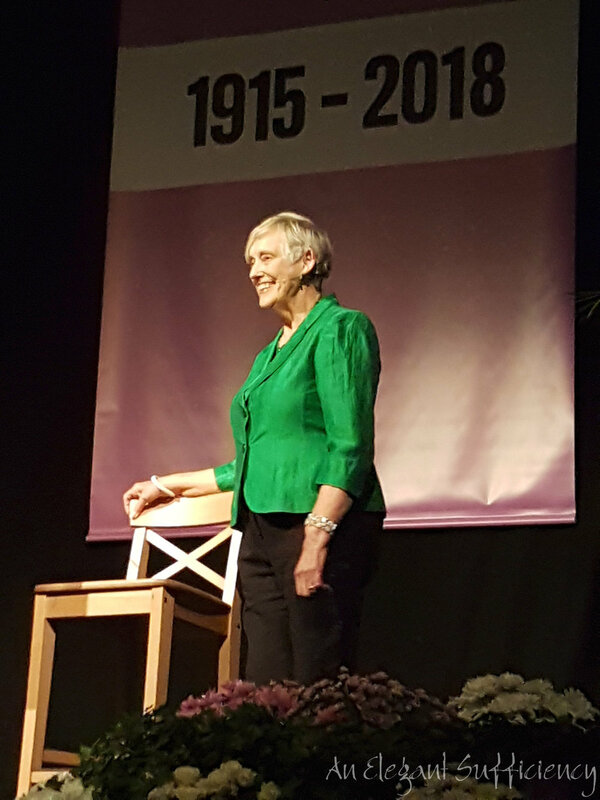 It was a grand meeting led with capable good humour by our chair, Lynne on a stage decorated in the suffrage colours of green, white and violet, commemorating the centenary of some women being given the vote. There was business to be done, of course - this is the Annual Meeting, when all is said and done - but the first guest speaker set the tone of the morning. Dame Stella Rimington was an excellent and eloquent speaker; one of those rarities these days to speak without notes nor Powerpoint. Her story was straightforward and amusing, but left us in no doubt about what a trailblazer she had been in MI5. Inspiring stuff. There followed some very persuasive arguments, not that most of us needed any persuasion to support the resolution. In spite of their best efforts, NFWI had not been able to find anyone to speak against it - neither member nor expert. My own WI had also agreed wholeheartedly in favour and as the delegates passed their votes to the stewards, it looked as though it was going to be a landslide. Sure enough, when the result was announced, 98% were in favour, with 5945 votes for and just 103 against. WI resolutions are the foundation on which our campaigns are constructed and after a brief update on progress regarding some of our previous projects: plastic soup, bees, and the care not custody campaign. It was this which prompted the next guest speaker, Huw Edwards, to focus the start of his address. A Welshman by birth, he was quite at home on the stage and having extolled the virtues of the WI campaign mechanism and democratic process, he went on to extemporise on the subject of change - unsurprisingly, particularly with reference to the business of news. After three quarters of an hour or so, he stood down and invited questions from the floor. I don't think he expected what was to follow, as a member from Oxfordshire stood up and began, "I was born in 1949 and in that year the NFWI campaign was for equal pay for women. Tell, me Huw, how do you feel about that in relation to your experience with the BBC?" Oooo. He did appear to shuffle from foot to foot a bit and looked very uncomfortable as he offered a fair attempt at an off the cuff answer. I think he was also relieved to find that there was time for only one further question which was in rather more frivolous mood and asked him to demonstrate the raised eyebrow expression as seen on the TV programme "Would I lie to you?" Reflecting on the newly restored coat of arms there was another rousing chorus of Jerusalem, followed by Land of My Fathers (Hen Wlad Fy Nhadau, sung in Welsh of course) and the National Anthem. Another Annual Meeting over and done with then. See you in Bournemouth next year? Jun 4 2011: quite a year!